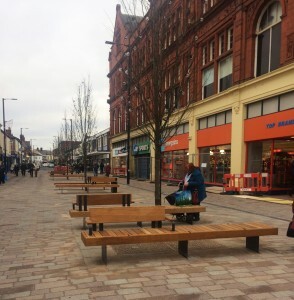 Goose Foot Street Furniture were approached by Re-form Landscape Architects to help develop the design for seating on the regeneration of Bradshawgate, one of the main retail areas in Leigh town centre. Working for Wigan Metropolitan Borough Council, Re-form were tasked with turning the busy shopping street into a pedestrian only zone. 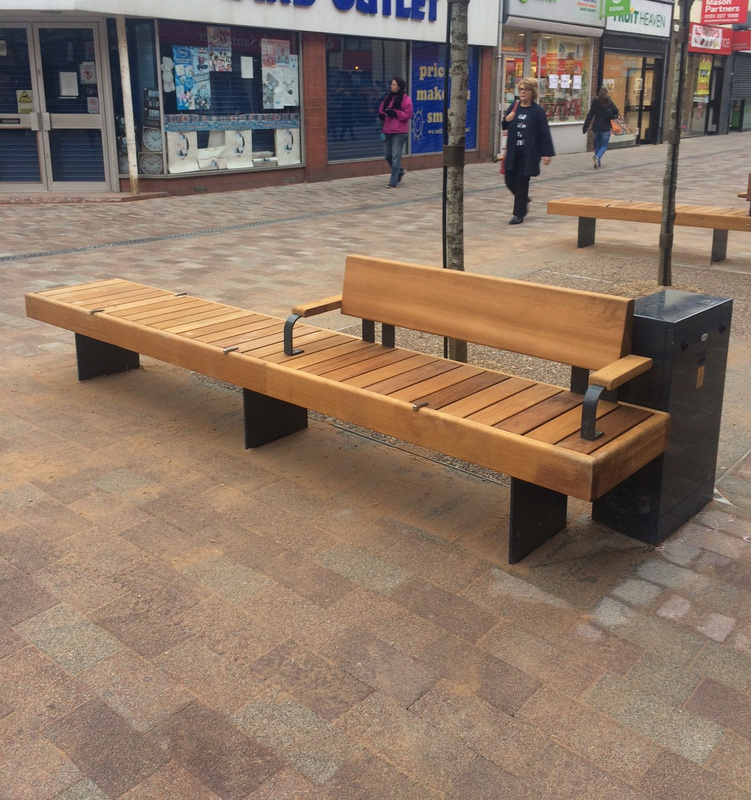 As part of the regeneration project, a series of 14 seats were required to be placed at either side of the newly planted trees in order to create a more attractive environment for shoppers, visitors and businesses. After liaising with Re-form over a period of months and after several tweaks to our design, we designed a bespoke seat that was public friendly and covered multiple usage. Our highly-skilled team of engineers manufactured the 3062mm long seats in-house, utilising our extensive laser cutting, fabrication and powder coating facilities in Lancashire. Each of the seats comprised of a fully welded mild steel frame and ‘i-frame’ legs which were hot dipped galvanised, fettled and polyester powder coated. The Iroko timber slats were then fastened from underneath and plinth panels were fitted, as well as half backrests and two armrests to assist users who require support. As they are set to one side, the remainder of the seat is suitable for wheelchair users and parents with prams or pushchairs. Erin Basey, from Re-form Landscape Architects, said: “Goose Foot provided much valued expertise and professionalism in developing the bespoke furniture with us for Bradshawgate. The quality of materials and workmanship is clear in the product and the benches have been well received by the client, project team and the general public. “We wouldn’t hesitate to work with Goose Foot on future projects”. 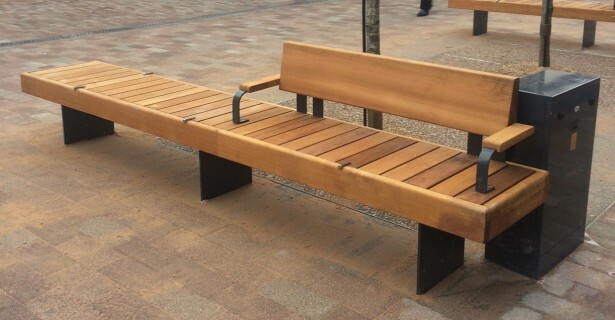 With over 30 years’ experience in the industry, Goose Foot is widely recognised as the go-to steel fabricator of bespoke street furniture solutions for urban realm and regeneration projects. We work closely with landscape artists and architects, building contractors and local authorities to custom-build furniture to their specifications, either in batch orders or as one off products.